What a Bummer (AKA - Another Run-In With Urgent Care)! This past weekend we were all supposed to be heading up north to visit my mom and step-dad for the weekend. We were looking forward to time spent fishing on the lake (well, the boys were, anyway), time spent relaxing and chatting with my parents and time seeing Kaylin, a dear friend from high school, on her wedding day. It was going to be such a wonderful weekend. However, it all came crashing down when my mom called early on Friday morning to say that my step-dad was really sick. She said that it would be just fine if we were still to come and stay, but she wanted to forewarn us in case he was contagious. Now, if you've followed my blog for awhile or if you know me, you are aware that Ethan has this awesome ability to get sick and to hang on to that sickness for a LONG time. Colds attack him, sink into his chest and stay there for a month. So, this decision was a really hard one for us, as we all REALLY wanted to go, but yet we knew that it wouldn't be right for us to expose our kids to sickness when we're so close to the end of the school year. We also felt that it would be really rude of us to come to my mom and step-dad's house while he was sick and bring all of our chaos with us. We understand that being sick is difficult in and of itself, but then when there are seven extra people in your house, it can be downright overwhelming! So, after hours of talking about it (I'm not kidding, we literally ran different plans through our heads and discussed them for HOURS), we made the decision that it wouldn't be feasible for us to stay in a hotel (where the kids would have to stay alone [and hopefully not kill each other] while we went to the wedding) and that staying in a hotel would make it difficult for the boys to do the fishing that they wanted to do without being exposed to sickness. SO, we decided we needed to stay home. I'm not even a little bit kidding when I tell you that it was a HARD decision to make - mostly because I didn't want to have to miss out on Kaylin's wedding. So, Monte and I picked up our attitudes (which were both in the toilet at that point, figuratively speaking) and set out to try and enjoy the day. Monte spent time getting our own boat ready to be in the water, as he had decided that he would take the boys fishing that Saturday, and I spent some time cleaning the house and getting the family ready for Claire's softball game. I brought her to the game and promised to return once we had loaded the entire family up in the truck and could get there. When we returned, she was up to bat. We saw her swing, then we saw her drop the bat and hop around while furiously shaking her hand (even though she was still holding it with her other hand!). She had obviously taken a hit, but because she picked the bat back up and went to hit again, we assumed that it wasn't that bad. After Monte went home to get her an ice pack and she had her incredibly swollen thumb in ice for awhile, we decided it was time for her to leave the game early and head to Urgent Care. Three X-Rays and a chat with the doctor later, we discovered that she fractured her thumb. The nurse put a splint on the thumb and we were sent home with instructions to follow-up with a hand surgeon this week. We are hoping and praying that surgery won't be necessary, but they have to look at the thumb to know for sure. 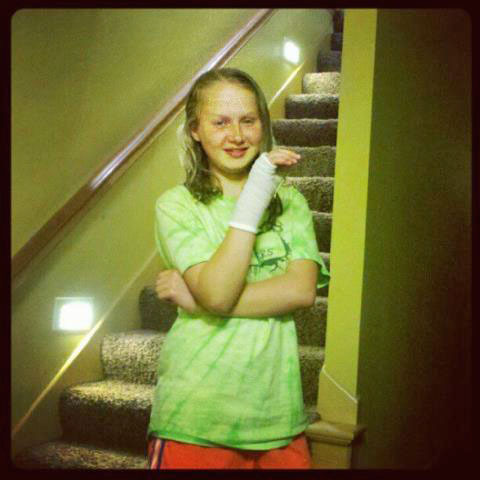 After we meet with them, they will put a cast on for her and she will truly be on the road to recovery. For now, though, she's learning to do as much as she can with her left hand, which isn't proving to be easy! I personally think it's also been a humbling experience for her, as she has had to rely on Monte and me for help with things that we fully take advantage of having the ability to do (like wash your own hair ... I got to wash her hair for her in the kitchen sink and style her hair, too ... it's like I have my own little dolly!). Get well soon, Claire Bear! !